Crowd control posts have your custom designs printed in 3 colours on both sides of the belt. This creates a new advertising and brand awareness spot for retail stores, museums, banks, airports, hotels, and more. 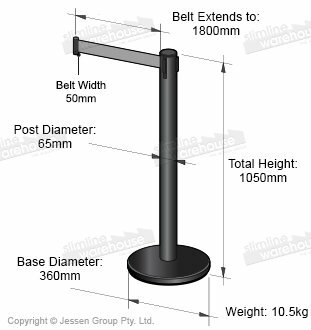 The custom stanchions have a 1.8m long grey woven nylon belt that can easily reach out to attach to other barricade systems and wall clips. The retractable belt barriers, crowd control posts assemble in minutes without any tools needed. 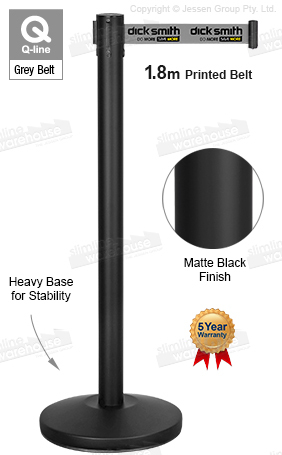 The base of the stanchions are weighted for stability and have a rubberised bottom to protect floors. A 4-way adapter helps make creating a queue or sectioning off an area easy in any location. The tamper-proof clip at the end of the belt helps ensure the retractable belt remains in place.